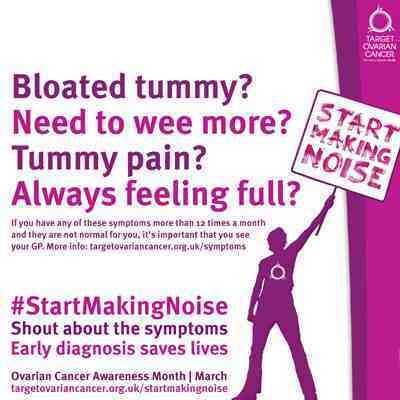 March 2016 is Ovarian Cancer Awareness Month and now it’s the perfect time to #StartMakingNoise and shout about the symptoms. England has the lowest survival rate for ovarian cancer in Europe so we really have to try and change this by spreading the awareness. Early diagnosis saves lives. 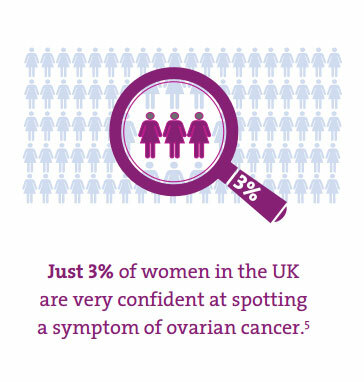 Did you know that only three per cent of women are very confident of spotting a symptom of ovarian cancer? Ovarian cancer is the fourth most common form of cancer death in women (1) and if diagnosed at the earliest stage, up to 90% of women would survive 5 years or more. At the moment most women are diagnosed once the cancer has already spread which makes treatment more challenging. Also, delays in diagnosing are not uncommon – sometimes women delay seeing their GP and sometimes GPs do not recognise the potential importance of the symptoms women report (1). Some women are more likely to experience ovarian cancer, in particular women over 50 who have gone through menopause. Over 8 in 10 cases will occur in this type of women. Do you have any close female relatives with a history of ovarian cancer and/or breast cancer? This could be a risk factor. About 1 in 10 cases have at least one member of the family who developed the disease. One of the main symptoms is persistent bloating which doesn’t come and go. This comes with abdominal pain and feeling full quickly. Needing to wee more urgently or more often than usual is another symptom which you shouldn’t ignore. In some occasions there are other symptoms as well like changes in bowel habits and extreme fatigue (2). If you have any of these symptoms yourself or you know someone who does, it’s important to get checked out. It may not be anything serious but you should definitely see a doctor as soon as possible. How can you get involved in Awareness Month? One of the simplest ways you could get involved is by spreading the word via social media – you could share the symptoms’ image or update your cover images. Find all the images you need here. I have updated my Facebook page cover, take a look here. There are also other ways you could get involved. See here how you could Start Making Noise today. 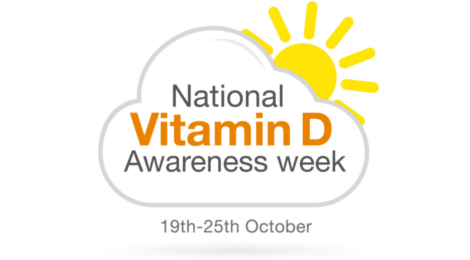 You can also request awareness materials such as leaflets and posters – you could hand out leaflets to your friends, family and contacts and you could ask your employer for the poster to be displayed in a prominent place. These materials are available free of charge to organisations and individuals resident in the British Isles. Let’s all Start Making Noise this Ovarian Cancer Awareness Month, let’s make a difference.